There’s never a good time to start a new religion. While common hazards used to include stoning or crucifixion, today’s would-be prophets face a new hurdle: fact-checkers. But Wright wasn’t. Despite Scientology’s “vindictive behavior toward critics and defectors,” The New Yorker submitted 971 fact-checking queries to the church and received 47 binders of documents in return — 7 linear feet of previously secret church papers. “Going Clear’’ is the product of three years of researching those 47 binders, along with interviews with over 200 current and former Scientologists, and what it reveals about the organization will disturb everyone who reads it. “Dianetics,’’ the foundational text of Scientology written by L. Ron Hubbard, was first published in the May 1950 issue of Astounding Science-Fiction. 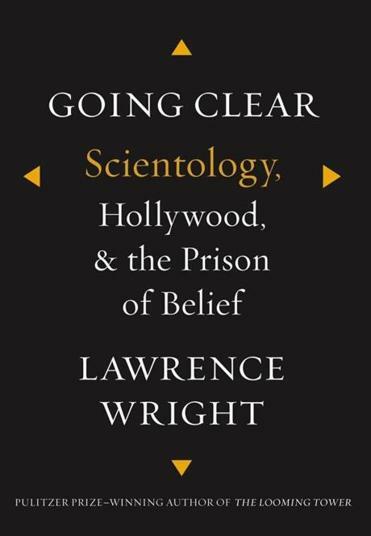 Wright devotes the first part of “Going Clear’’ to Hubbard, a man he describes as “complex, charming, delusional, and visionary,” following Hubbard’s extraordinary journey from pulp sci-fi author to religious leader. According to Wright there may be only 25,000 to 30,000 active Scientologists worldwide, but the church holds $1 billion in liquid assets, a figure that “eclipses the holdings of most major world religions.” The money comes from “relentless fund-raising, the legacy of Hubbard’s copyrights to the thousand books and articles he published,” and the structure of Scientology’s program, in which believers must pay money in exchange for spiritual progress (via a process known as “auditing”). The second section of Wright’s book, “Hollywood,” provides the answer to one of the great mysteries of the modern world: What’s the deal with Tom Cruise and Scientology? As early as 1955 Scientology published a list of celebrities it described as “game” to be “hunted,” including Marlene Dietrich, Bob Hope, and Walt Disney (none of whom took the bait). Scientology opened its first Celebrity Centre in 1969 in Hollywood to cater to the special needs of those burdened by fame, which today includes John Travolta, Kirstie Alley, Beck, Will Smith, and Greta Van Susteren, among others. But Cruise is by far Scientology’s biggest trophy and most visible cheerleader. “There are really three tiers of Scientologists,” Wright explains. Cruise and other celebrities enjoy special status at the top. Below them are the everyday Scientologists — anyone who buys a copy of “Dianetics’’ and signs up for “auditing” These make up the majority of church members. At the bottom are, ironically, the clergy: the several thousand members of Sea Org, many of whom joined as children. Almost all of the controversies surrounding Scientology stem from the experience of Sea Org members, but the church’s aggressive policy against naysayers has been disturbingly effective. The Cult Awareness Network, for example, was one of Scientology’s loudest critics until the church drove the group into bankruptcy in 1996, bought the rights to its name, and relaunched it as a pro-Scientology organization. The Riverside Sheriff’s Department says it has never received a single report of abuse from anyone at Gold Base. “Although the Sea Org members lived inside a highly secure compound in a desert hideaway, surrounded by fences and high-tech sensors,” Wright argues, “most of them weren’t really being held against their will. On the contrary, it was their will that held them.” All the fact-checkers in the world can’t change that. Buzzy Jackson, a historian and author, can be reached at askbuzzy@gmail.com.